We have a small, nine pitch site and facilities include electric hook-up, hard-standing, W/C, wash basin with hot and cold running water and separate shower. Free Wi-Fi access is available upon request. Fowberry Farm is set in rolling countryside with panoramic views of the breathtaking Bamburgh Castle and the stunning Farne Islands. Dogs are welcome if kept under control and there are miles of dog-friendly sandy beaches. There is a footpath from the farm to the coast, which takes only 15 minutes to walk. 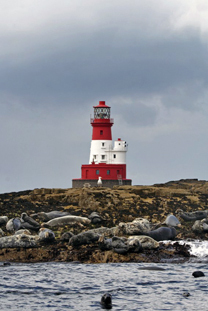 There are trip boats to the Farne Islands leaving from Seahouses harbour on a daily basis during the season and there is a good information centre in Seahouses where local information is freely available. Travelling South from Bamburgh to Seahouses just before you reach Seahouses you will see a right hand turn signposted Shoreston. Just past the Hall take a right hand turn, it is signposted Fowberry Farm, and stay on that road 1 mile and you will come into the farmyard.